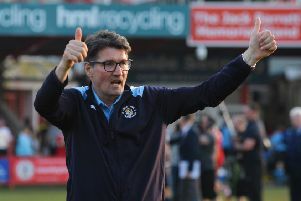 Luton interim boss Mick Harford will ensure his side remain grounded despite the jubilation of beating second-placed Portsmouth on Tuesday night. A magnificent performance at Kenilworth Road by the Hatters saw them triumph 3-2 over their nearest promotion rivals, who have been long-time leaders of League One this term. It sparked wonderful scenes of celebration at the end, as Town moved five points clear of Pompey, but Harford wants Luton to put that behind them as they head to struggling Shrewsbury this afternoon. He said: "There’s always a good environment here and we’ve enhanced that by winning football matches and playing the way they are playing. "So everyone’s in high spirits, but you know what football is all about, we keep our feet on the ground. "We know what a good performance we put in over the last two or three games, now we need to concentrate on Shrewsbury and I will be getting the boys back to down to get ready for a really, really tough game. “We’re in a good position, the team’s playing well, the team’s in form, the players are enjoying themselves. "The atmosphere in the stadium among everyone was just amazing the other night, so there’s a feelgood factor, but we have to be professional. "We’re all buzzing after that game, it was a fantastic game of football, it was theatre. "At the end of the game, the fans, they helped us get over the line, played a big part, the players and everyone involved at the football club, so everyone’s on a bit of a high, but we need to concentrate on the future now. "That’s gone, we’re proud of the way we played, we’re proud of the last few games, we’re proud of the season that’s behind us, but we must concentrate on what’s coming forward and the challenges ahead of us. "We have to go about our jobs the right way, we have to work hard and that’s what I’ll be instilling into the squad. "Because it’s getting back to the basics, we’ve got a tough, tough game at Shrewsbury."